Director: Edmund Goulding. Cast: John Barrymore, Greta Garbo, Joan Crawford, Lionel Barrymore, Wallace Beery, Lewis Stone, Jean Hersholt, Rafaela Ottiano, Ferdinand Gottschalk, Robert McWade. Screenplay: William A. Drake (based on his play adaptation of the novel Menschen in Hotel by Vicki Baum). My friend Matthew Kennedy has recently published a fantastic new biography of director Edmund Gouldingremarkably, the first published chronicle of the life of this popular, prolific, notoriously dashing filmmaker. The book was written partly in hopes of drawing attention to Goulding's diverse and hugely entertaining movies. With the same hopes, but also to bring readers to this great and long-overdue book, I'll be adding reviews of some of Goulding's most famous and accomplished movies. Congratulations, Matt! Movie stars existed before Grand Hotel, and yet this picture seems to reinvent the whole concept right before your dazzled eyes. During the opening credits, each of the array of assembled talent poses in front of a celestial matte, the names of the actors writ larger than those of the characters. It's hard to tell what's more delectable: the one-after-another parade of names like Garbo, Crawford, Beery, Stone, Hersholt, and two Barrymores, or the luminous figures they cut in their Adrian gowns and 1930s tuxedos, or the flavorful, improbable names like Grusinskaya and Baron Felix von Geigern and Dr. Otternschlag that supply their guises in what's coming. What is coming is simultaneously run-of-the-mill and dreamily entertaining. The whole movie is structured as exactly what it is, an interbraiding of star turns doing personality performances, with the ritzy hotel as glamorous backdrop and convenient context for all these run-ins and rendezvous. Garbo plays the faltering Russian ballerina, Grusinskaya, whose reviews have been ebbing of late though she still shows plenty of flair at dramatizing herself. "I've never been so tired in my life," she moans, as we meet her, poured overtop of her satin-sheeted bed. "It's not stage fright, it's something more. Last night, I was not loved!" Garbo will soon enough be loved, by John Barrymore's Baron, who initially drops into her suite with trouble in mind. Financially down on his luck, the Baron finds love where he was looking for moneybut then, his "man's pride" at being penniless leads him to desperately hunt down better fortunes elsewhere in the hotel before eloping with his majestic new flame. Meanwhile, Lionel Barrymore, always the most florid of the clan, goes whinging around as Otto Kringelein, a dying man intent on spending out his savings in the fantasy land of Berlin high life. His pitiful frailty and romantic dreams are rather obviously contrasted with Wallace Beery's growling immorality as Preysing, a textile merchant who is trying to save his business by merging it with another company. If the phrase "he won't stop at anything until..." has come to mind, you're on the right track, and if economic buccaneering weren't bad enough, he's got clammy designs on Flaemmchen, the perky and vaguely worldly-wise stenographer played by Joan Crawford. Jean Hersholt is the head porter waiting day and night for a report from the hospital where his wife is in labor, and Lewis Stone, perfectly named with his hard, granite face, is the jaded hotel doctor who watches all the bustle around him and intones in his weary way, "Grand Hotel. Always the same. People come, people go. Nothing ever happens." In a way, Dr. Otternschlag is right. The turns of this plot are soapy and mostly predictable, and it's not the story points you are most likely to remember. But you will remember the fraying self-possession of Garbo's prima ballerina, delicate and man-reliant in ways we don't think of her as being. Goulding does put her through some embarrassing soliloquies, as she rhapsodizes to her own telephone while in the throes of her new love. (This is not the only time the dialogue is a source of trouble; the script itself is far enough down in the movie's set of priorities that it doesn't even specifically bill a screenwriter, just the play by William Drake and the source novel by Vicky Baum.) 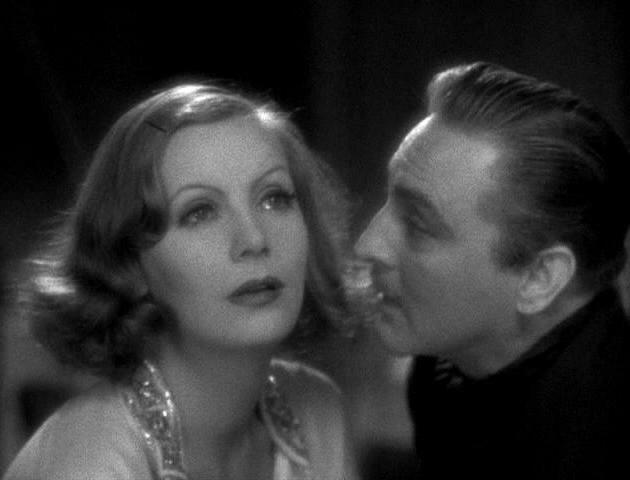 Garbo has often been better, but she's still a riveting presence, and she does achieve some real chemistry with Barrymore. Best of all, though, is Crawford, who is loose and sly as a character who keeps revealing new sides of herself, never fully abandoning the ingénue archetype but still keeping us guessing about Flaemmchen's thoughts and motives, wondering how far she'll go to get what she wants (and what is that, anyway?). Joan was quite an actress, particularly when she wasn't cast as the heavy or ensconced as the glamorpuss. With Garbo around stealing the limelight, Crawford's given a little more room to, you know, actand those wide, expressive eyes of hers, that pliable voice, and her pregnant, highly ironic pauses make her the most fascinating figure on screen.